July 22, 2014 – It was only a matter of time before it happened. It was only a matter of time before someone attempted to mix the different generations of jersey in the one ensemble. On Saturday last it was Alpine tourer Peter Rush who made the bold move to base-layer Spiderman under the retro Le Maillot Violet, as the present jersey has been dubbed. Eye-brows were raised at the unusual sight, but he wore it well. Chapeau. Going where no man has gone before; Spiderman base-layer under current kit jersey. 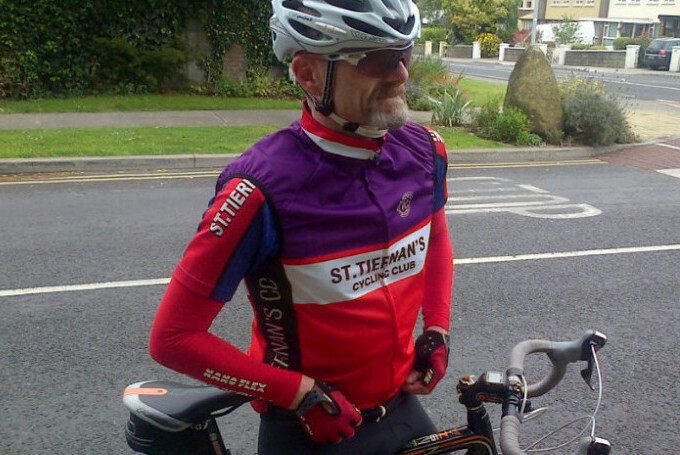 The route took the five riders to Enniskerry-Long Hill-Laragh-Gleneally-Bray-Enniskerry. It was a century ride for most. No Replies to "Fashion: Spiderman vs Retro"